The horses of today are the product of years of selective breeding to produce the best possible horse for the task at hand, whether that is racing, dressage, reining and cutting, trail riding, or any of the other tasks that we ask of our horses. Throughout most of the history of horse breeding, breeding has been done by eye, or by measures of performance. Champion stallions are picked to sire the next generation. However, this practice comes at a price. The genetic material of some champions can harbor genetic variants that were quite rare in that champion's generation. 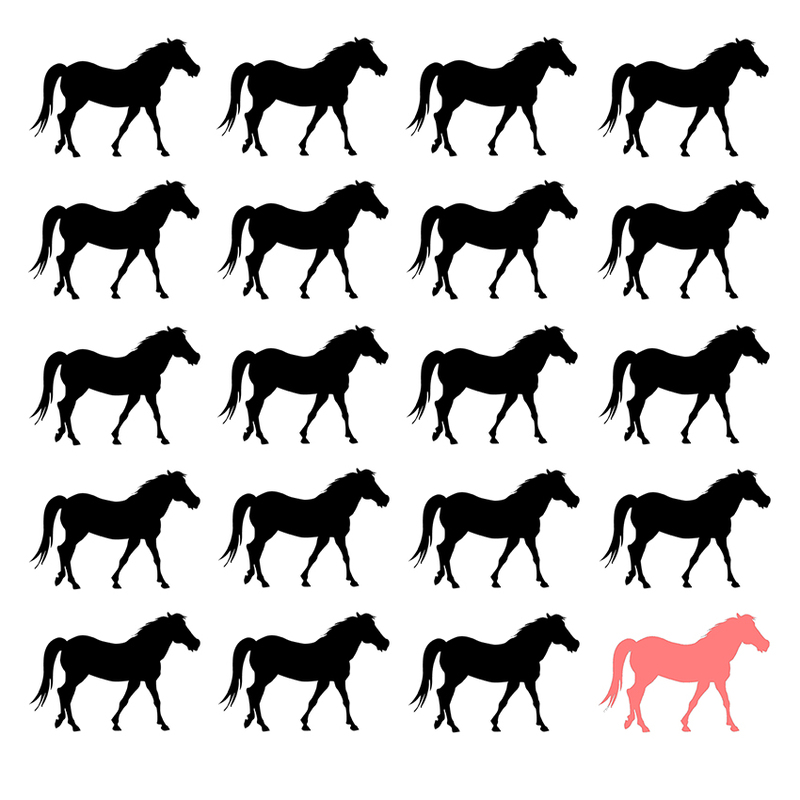 A stallion with a rare variant that sires a large number of offspring will cause the frequency of that undesirable trait to increase greatly in subsequent generations. 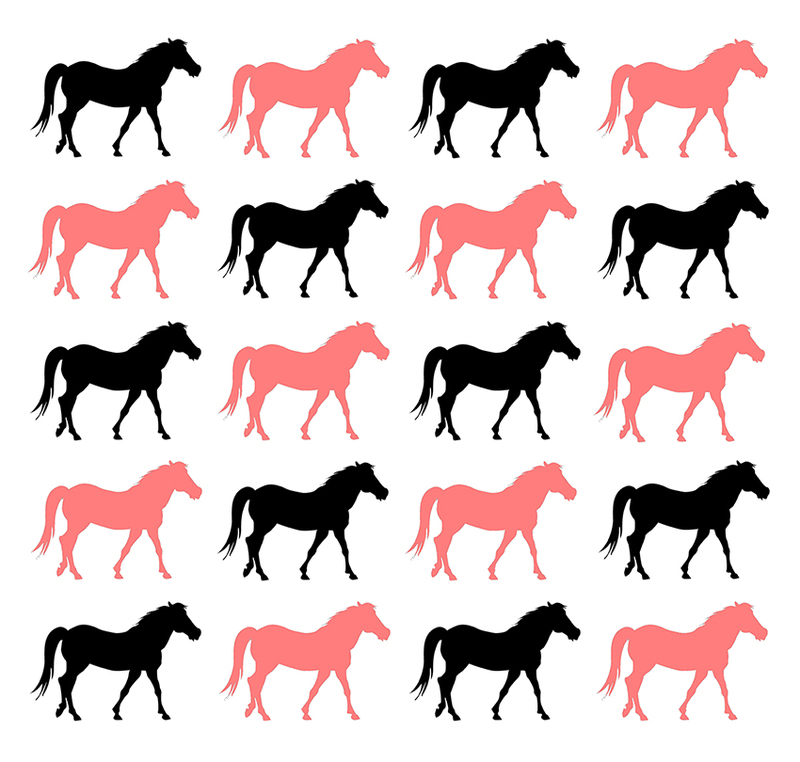 In this example, imagine that there are 20 stallions that represent the potential sires for the next generation of the breed. Suppose one of them (in red) is a carrier of a recessive undesirable genetic trait that is not evident in carriers. What happens if this stallion is picked, and none of the others is bred? Half of the offspring of the carrier stallion will be carriers. The incidence of carriers has jumped from 1 in 20 (5%) to 10 in 20 (50%) in a single generation. This simplified example shows how breeding from a limited pool of sires can cause undesirable traits to become established in a breed. The inherited condition Hyperkalemic Periodic Paralysis (HYPP) has been traced to Impressive, a popular Quarter Horse sire. The condition has become common in Quarter Horses, Paints, and Appaloosas due to the popularity of Impressive in a horse's pedigree. The American Quarter Horse Association now requires genetic testing for HYPP, and the American Paint Horse Association will be requiring it in 2017. These breed organizations hope to reduce the incidence of this condition and the hardship that it causes among horse owners. Researchers at EquiSeq are working to develop new genetic tests for conditions common in some breeds, like Polysaccharide Storage Myopathy type 2 (PSSM2), Recurrent Exertional Rhabdomyolyis (RER), and Myofibrillar Myopathy (MFM). These tests will make it possible to breed out these undesirable traits. As our understanding of horse genetics improves, EquiSeq's tests will identify additional traits that improve performance. Improved breeding for performance will make it possible to breed horses like the world has never seen. Whether you are a horse owner using genetic testing as part of a pre-purchase exam, or a breeder interested in producing the best possible horses for others, EquiSeq's genetic tests can give you the peace of mind that comes from having all the information that you need to make the right decisions.